When Oil Prices are high ($90 and above), the activity conducted on wells is priority above efficiency, or overall effectiveness. But when prices come falling down as they have over the past year, there is a big push for cost-cutting measures and a scramble to high-grade projects with the most potential. While tackling the challenge of increased activity, it is easy to ignore the critical components of a solid Well Life Cycle Framework (WLCF), and just push through activity after activity, as long as production increases. It is simple because the revenue of all that production simply masks inefficiencies. We do it because we can get away with it. Now in the scramble to effectively cut costs and not lose critical potential margin increases (cut costs, increase production scenarios), companies cannot afford to ignore any of the components of a WLCF. What is a Well Life Cycle Framework? A WLCF in its truest form is the combination people, information, processes, and assets producing oil and gas reserves in the most efficient manner possible, and at the optimum potential. A team of multi-disciplined people capable of executing on good judgment. This team will efficiently manage costs, evaluate and execute projects, increase margins, and contain costs throughout the asset base. Without capable team members, your assets will suffer greater inefficiencies over time. 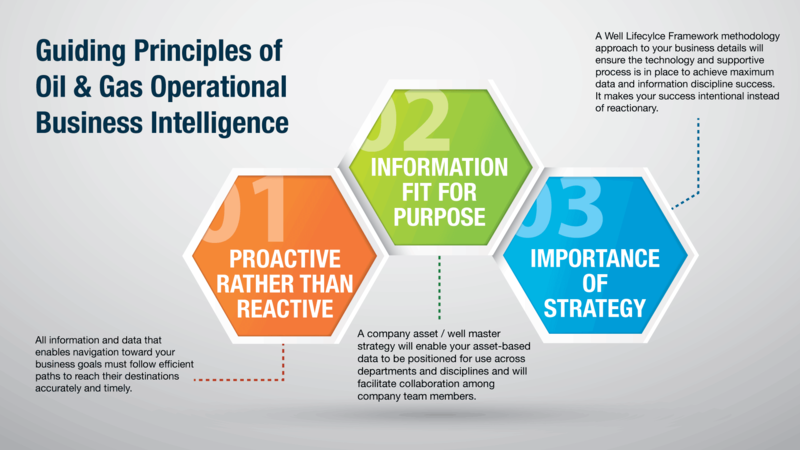 The oil and gas industry has complex information requirements to successfully execute good decisions. Delivering information to your team in a timely and integrated manner will bring greater insights and observations necessary to craft and execute measures that lead to efficient production. The level of integration that your information has will have a direct impact on the insights afforded to your team, and therefore your team’s efficiency. Executing initiatives that cut unnecessary costs requires a complete operational overview. A well-integrated platform for the flow of information will substantially reduce the redundancies often experienced in oil and gas companies. Particularly when accurate and timely information is required for various disciplines to conduct their functional jobs. Well-documented processes that effectively utilize and compliment both your team and your integrated platform will result in greater cost control and increased production opportunities. Make sure your team is well trained in the processes that will accomplish your goals. All of the above are designed to support good assets capable of producing economical results. Enabling good people with good information (built on solid well life cycle processes) will drive your team to greater profitability and less risk. The following diagram depicts the increased efficiency as an operations company works toward good integration with solid processes. The relationship between your people and processes, and the results you will realize, are based on a foundation of solid data governance. The more integrated your information, the more insightful, active, and efficient your operation becomes. Your data is no longer segmented between programs and departments, but is poised to be harvested immediately wherever it is needed. Achieving complete data integration is one very giant step in the right direction. Once there, however, you must be ready to develop a strategy that utilizes that information in an optimal fashion. Below is a starting point for developing that strategy. These are the principals that will guide you through creating the necessary processes, and your company will become a well-oiled (pun intended) production operation. Total Stream Systems works with operators to develop a robust and efficient Well Life Cycle Framework. We conduct “lights on” sessions with operators designed to create dialogue around potential opportunities and identify tangible steps a company can take to improve visibility, flexibility, and efficiency in their operations environment.